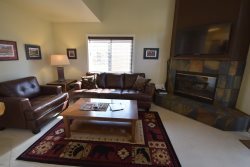 Enjoy this 3-bedroom Whitefish Lake home with stunning views of the lake and mountains from the two decks that also offers a boat dock for your summer time toys, rent locally or bring your own boat, kayak or canoe or simply relax and enjoy the views from the spacious deck or lakeshore. Recently remodeled with upgraded kitchen, new appliances, flat screen T.V's and charmingly decorated. Air conditioning in both upstairs bedrooms. Spacious master bedroom upstairs has a king bed, large windows with plenty of light and sliding doors to it's own private deck. Second bedroom has a Montana style four poster queen bed and the third bedroom has a queen bed and a double bed with a twin bunk above. Sleeps 7 people. Located on the shore of Whitefish Lake and just a short drive to downtown Whitefish with Glacier National Park about 45 minutes away.